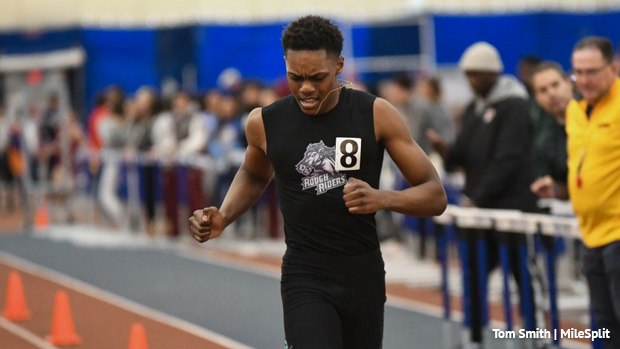 The West Side boys made history on Sunday by winning sectional indoor titles for the first time ever at the NJSIAA North Jersey, Section 2 Group 2 Championships at the Bennett Center in Toms River. 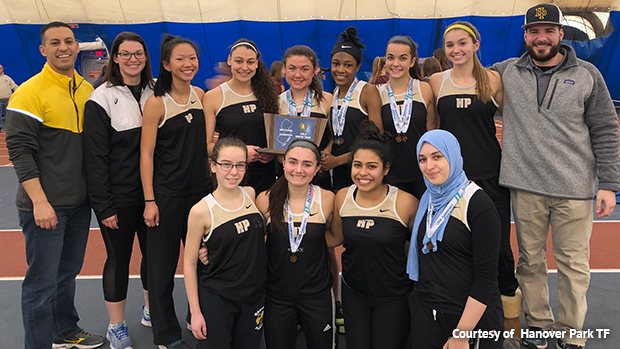 The Hanover Park girls won their second all-time after sharing the title with Parsippany in 2016. In the girls competition, Hanover Park, led by junior Grace Reynolds and sophomore Kimora Johnson, scored in nine of the 10 events on the way to a 54-50 victory over runner-up Bernards. Reynolds capped off a sensational triple by winning the 3,200 in 11:55.69 to give Hanover Park a 10 point lead over Bernards heading into the meet-concluding 4x400 relay. In the relay, Bernards placed second in 4:09.68, just behind Gov. Livingston (4:09.24), and Hanover Park placed fifth. In addition to her victory in the 3,200, Reynolds also finished third in both the 800 (2:24.62) and the 1,600 (5:15.58) to score a total of 22 of Hanover Park's 55 points. Johnson also had a big day for Hanover Park, placing second in both the 55 dash (7.50) and the 55 hurdles (9.03). The other points for Hanover Park came from Carina Cooke, third in the pole vault (7-6), Devon Fagan, sixth in the vault (7-0), Rania Benatia, fourth in the shot put (33-0), Gianna Tito, fifth in the shot (30-1 1/2), and Eliza Bruncaj, sixth in the high jump (4-8). In other girls highlights, junior Victoria Vanriele of Gov. Livingston won her third straight girls 800 title in 2:12.33, and anchored the winning 4x400. This came a day after Vanriele placed second in the 600 at the Millrose Games in 1:30.64, the No. 2 time in the nation this season and N. 16 in U.S. history. Vanriele has won four M of C titles in her career in the 800 (two indoors/two outdoors). Junior Jenna Rogers of Rutherford, the defending Meet of Champions winner in the high jump, won that event by clearing 5-2. Rogers is NJ#1/US#4 this season at 5-10 and owns a PR of 6-0 3/4, which stands as the national freshman outdoor record. Rogers she cleared 6-0 3/4 to win the New Balance National outdoor title in 2017. Junior Jenna Chan of West Essex won the 55 dash in a personal best 7.49 and the 55 hurdles in 8.63. On the boys side, Jarrett Gentles, Quincy Hendy and Jakai Coker combined for 52 of West Side's 66 points as the Rough Riders outscored runner-up Bernards by 18 points to capture the title. Gentles, a senior, had a unique triple for West Side..He placed second in the high jump at 5-10, won the hurdles in 8.01, and finished first in the 800 in 2:02.24. The HH/HJ double is common, but the 800 on top of those two events is a very rare triple. Hendy, a sophomore, won the 400 in 51.66 and placed second in the 55 dash in 6.76 (6.70 in the trials). Coker, a senior, took second in the 400 in 52.25 and was fifth in the dash in 6.78. West Side's other 14 points came from the 4x400 team, second in 3:34.50, and from Darius Gooden, third in the hurdles in 8.07.